Before the late Steve Jobs came back to Apple in 1997, the company manufactured dozens of different Macintosh desktops, laptops, and servers. They also produced lines of printers, and digital cameras. Few of these products were making a profit. One of the first actions Jobs undertook was to trim the fat. He cut 70 percent of Apple’s hardware and software products. His product cuts resulted in the layoffs of over 3000 employees. Painful? Yes. Necessary? Absolutely. The company was losing profits and headed down fast because they were spread too thin.. They needed to focus their efforts on creating one good product. The iMac, introduced in 1998, was that product. Sales resulted in a profit of $309 million. The first in five years for the company. Steve Jobs engaged in product rationalization. A process a company undergoes where product variety is cut to invest more in the products that make the most profit. Rationalization is an essential activity as it helps a company boost its revenue, decrease unnecessary costs and ultimately, improve its bottom line. In project management, rationalizing your project portfolio involves taking a holistic view of the organization’s projects to assess the value of each project. Those delivering superior values are kept while those that are not being eliminated. Project portfolio rationalization has project managers use investment management or governance approach for their review. This means treating each project as an investment. This enables the use of the same analytical criteria across the board which is what value do they bring to the business based on the effort, energy, and money that went into them. 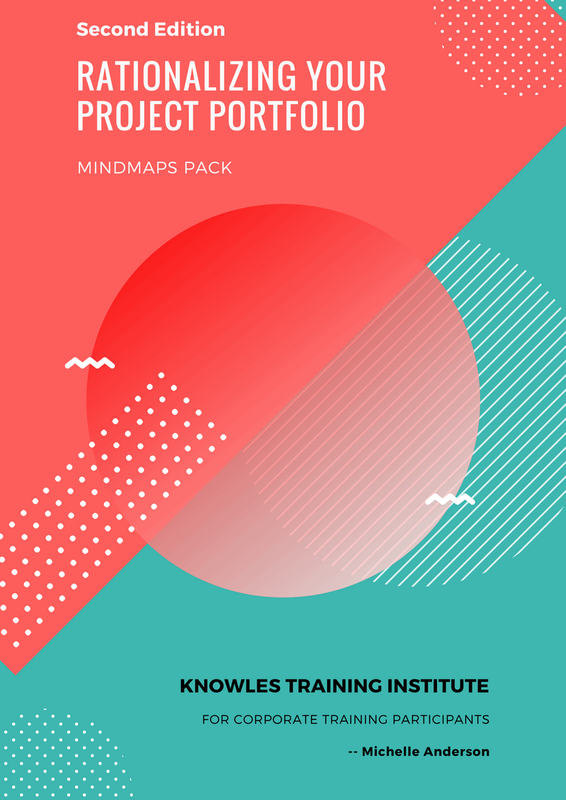 This course helps participants define what rationalizing a project portfolio means and helps them understand why it is an essential aspect of project management. Participants, at the end of the course, have the skills, knowledge, and tools to create useful criteria for project portfolio rationalization and implement them successfully. 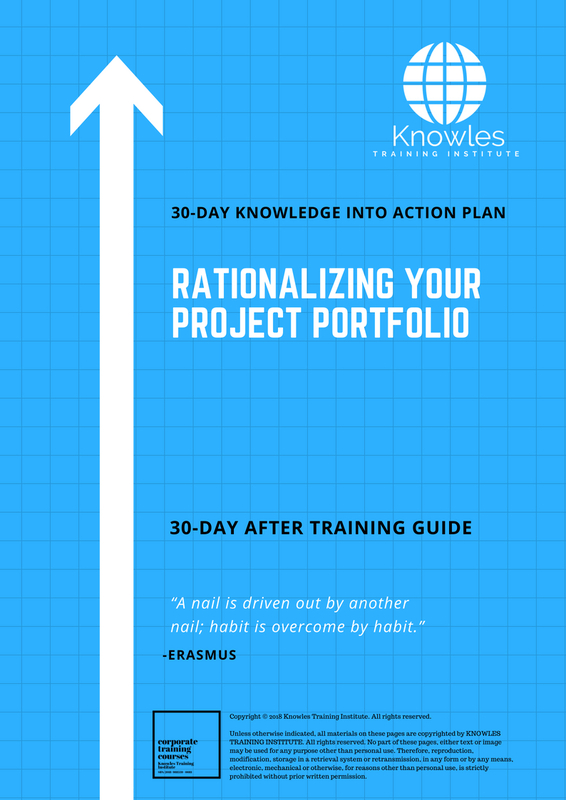 This Rationalizing Your Project Portfolio workshop is ideal for anyone who would like to gain a strong grasp and improve their Rationalizing Your Project Portfolio. The duration of this Rationalizing Your Project Portfolio workshop is 1 full day. Knowles Training Institute will also be able to contextualised this workshop according to different durations; 2 full days, 1 day, half day, 90 minutes and 60 minutes. ● Increase career advancement opportunities. ● Clearly explain what a project portfolio is. 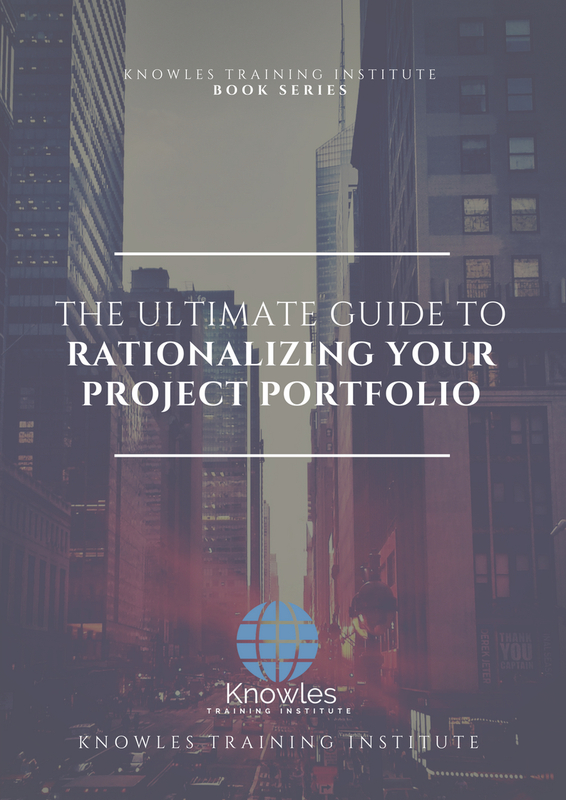 ● Understand what rationalizing your project portfolio means. ● Show the importance of rationalizing project portfolios. ● Be adequately prepared for the challenges of rationalizing a project portfolio. 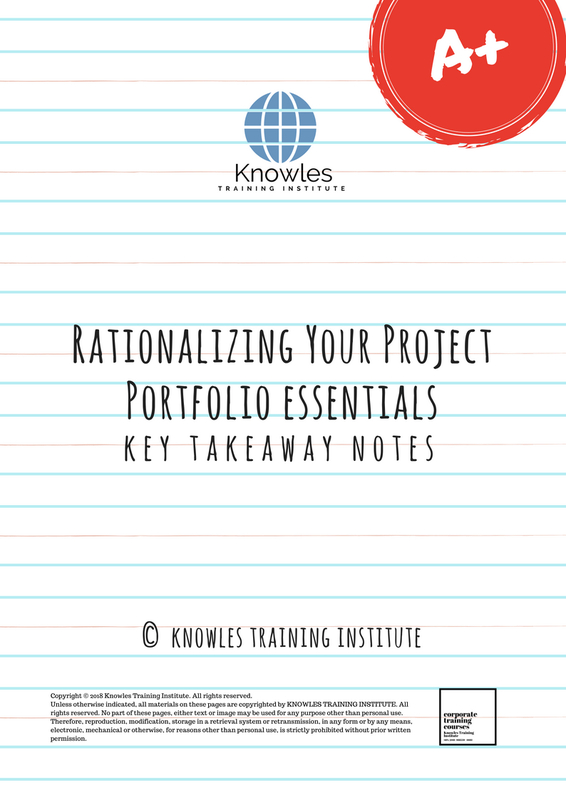 ● Know the benefits of rationalizing your project portfolio. ● Keep an eye on all projects in the business using standard criteria. ● Avoid common errors when rationalizing your project portfolio. ● Use consistent criteria to reach a timely consensus on what value a project brings to the business or not. ● Known when reallocate, reprioritize, reschedule or cancel projects. ● Eliminate low impact projects from the portfolio. ● Communicate rationalization decisions with senior management. ● Increase company revenues by eliminating low-value projects. ● Better utilization of project resources. ● Definition of a project portfolio. ● What rationalizing your project portfolio means. ● Importance of rationalizing your project portfolio. ● Challenges of rationalizing your project portfolio. ● Benefits of rationalizing your project portfolio. ● Project portfolio rationalization process. ● How to categorize projects in a portfolio. ● Collecting key project data for rationalization. ● Assessing the current strengths and weaknesses of projects in the portfolio. ● Implementation of rationalization actions. ● How to communicate rationalization decisions. ● Common errors to avoid when rationalizing your project portfolio. 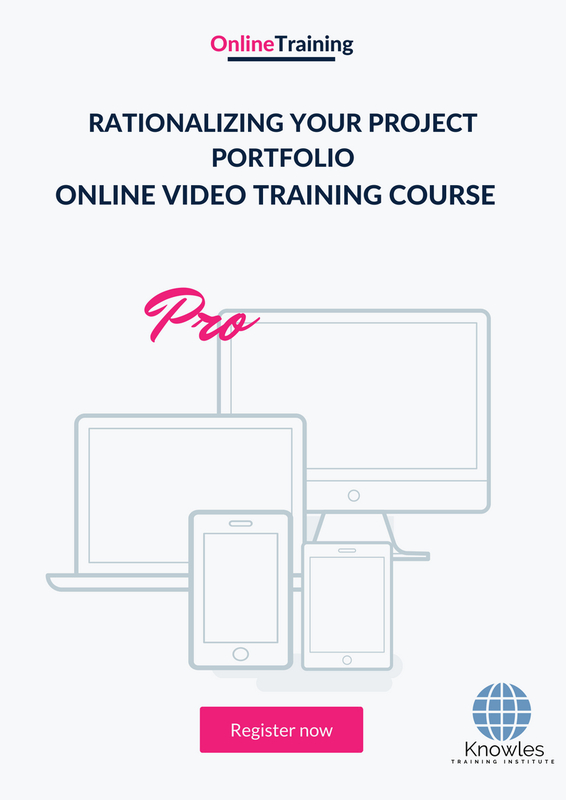 There are 3 pricing options available for this Rationalizing Your Project Portfolio training course. 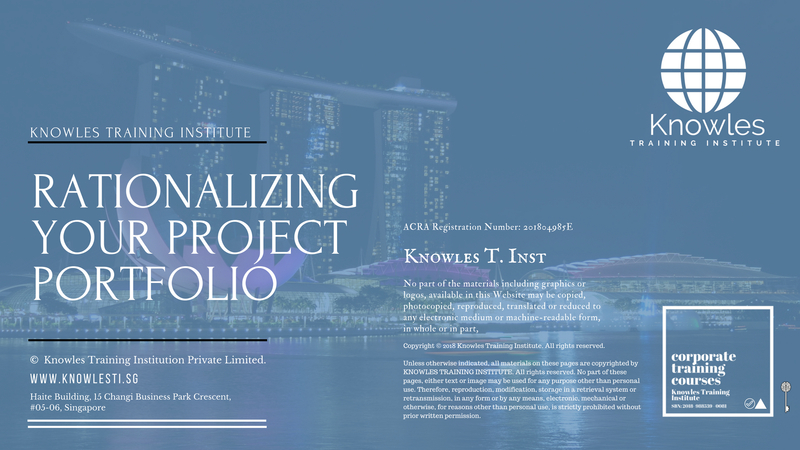 Course participants not in Singapore may choose to sign up for our online Rationalizing Your Project Portfolio training course. 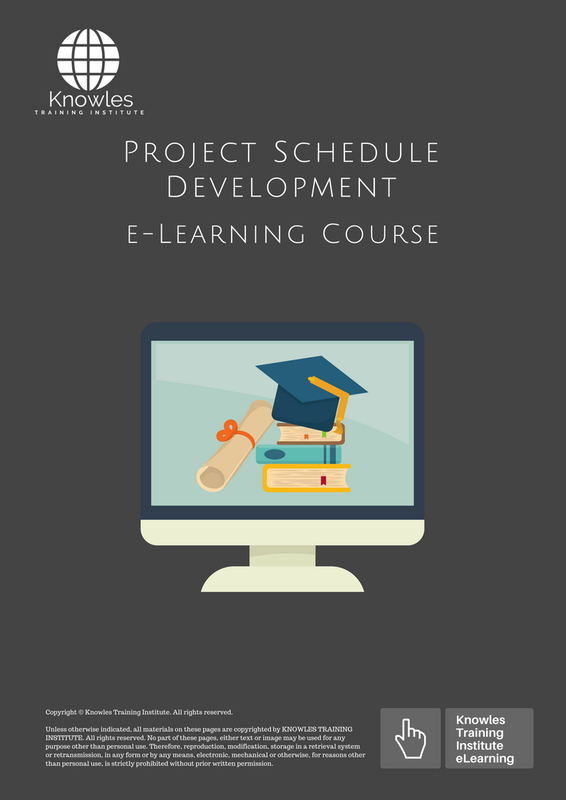 Request for this Rationalizing Your Project Portfolio course brochure. Fill up the short information below and we will send it to you right away! 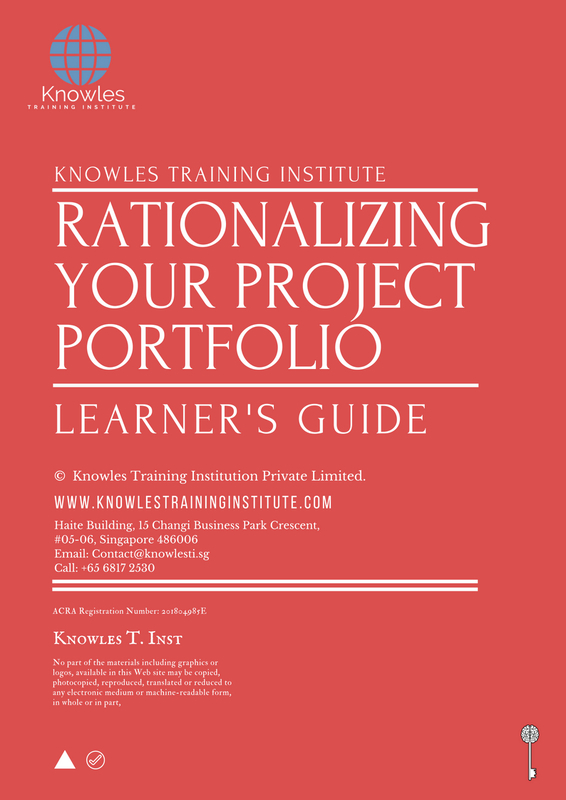 Register For This Rationalizing Your Project Portfolio Course Now! 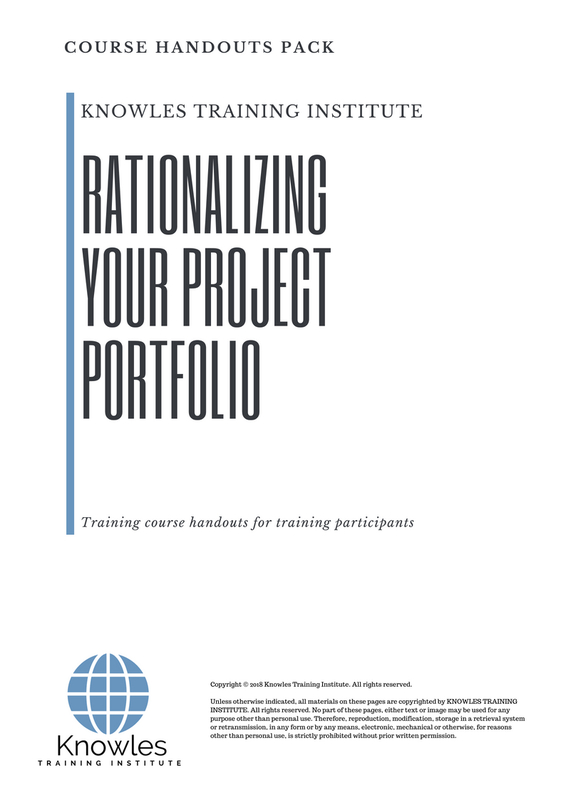 Share This Rationalizing Your Project Portfolio Training Course! Rationalizing Your Project Portfolio course, workshop, training, class, seminar, talk, program, programme, activity, lecture. Rationalizing Your Project Portfolio courses, workshops, classes, seminars, talks, programs, programmes, activities, lectures in Singapore. Rationalizing Your Project Portfolio improvement tips, Rationalizing Your Project Portfolio techniques, improve Rationalizing Your Project Portfolio, improve Rationalizing Your Project Portfolio games, Rationalizing Your Project Portfolio improvement exercises, improve Rationalizing Your Project Portfolio power, how to have good Rationalizing Your Project Portfolio, how to have good Rationalizing Your Project Portfolio in studying, how to build up your Rationalizing Your Project Portfolio, how to improve Rationalizing Your Project Portfolio how to improve Rationalizing Your Project Portfolio course in Singapore. Enhance, boost, build up, enlarge, heighten Rationalizing Your Project Portfolio course in Singapore. Increase, intensify, raise, reinforce, strengthen Rationalizing Your Project Portfolio. Upgrade, amplify, boom, elevate, exaggerate, magnify, grow, gain Rationalizing Your Project Portfolio. Develop Rationalizing Your Project Portfolio, multiple, power up, beef up, bolster, establish, extend Rationalizing Your Project Portfolio. Invigorate, restore, step up, toughen, empower, fortify, regenerate Rationalizing Your Project Portfolio. Rejuvenate, renew, escalate, expand, maximize Rationalizing Your Project Portfolio. Powerful, mighty, impressive, competent, great, excellent, exceptional Rationalizing Your Project Portfolio in Singapore. 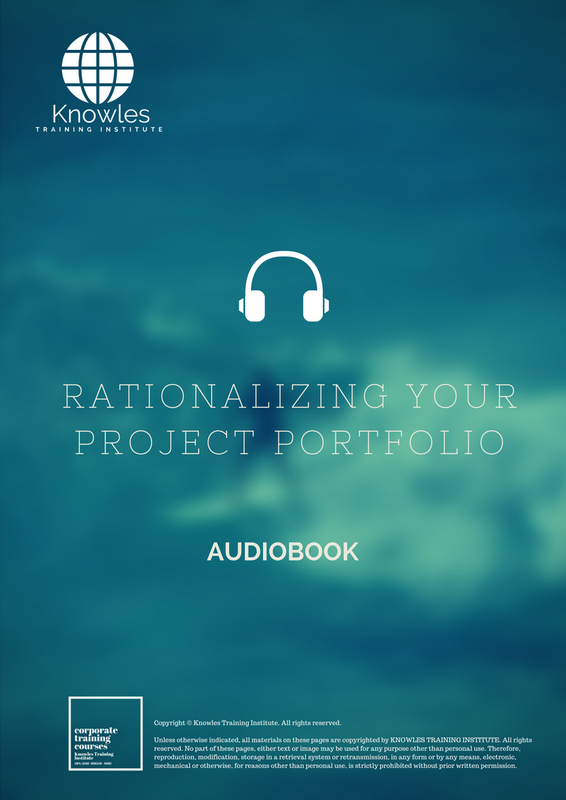 Superb Rationalizing Your Project Portfolio. Super, superior, strong, solid, active Rationalizing Your Project Portfolio training courses and workshops in Singapore. Rationalizing Your Project Portfolio enhancement, booster, building up, enlargement, heightening, increment, strengthening, amplification. Rationalizing Your Project Portfolio magnification, growth, development, power, empowerment, regeneration. Rationalizing Your Project Portfolio rejuvenation, development, escalation, expansion. 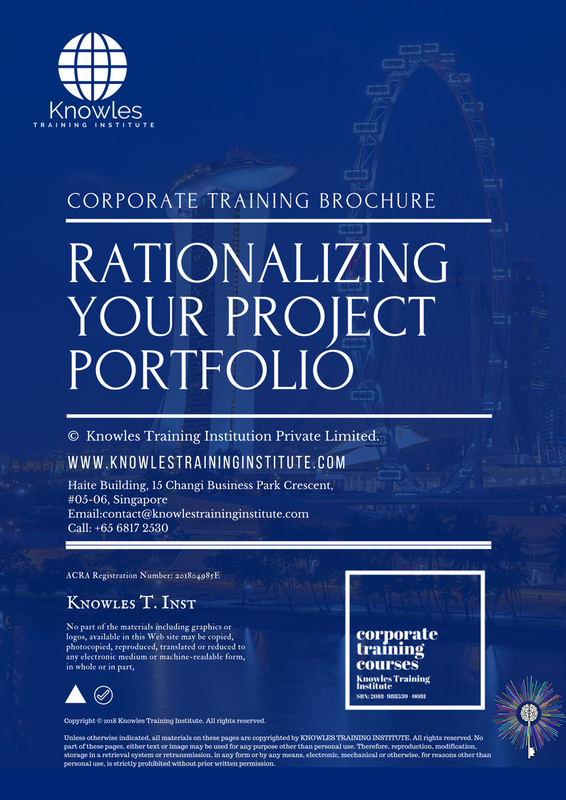 Rationalizing Your Project Portfolio maximization, power training courses & workshops in Singapore.